Eighty others accompanied Mahatma Gandhi on his Dandi March to break British salt law, largely to fade into oblivion. Dandi March was a giant stride in India’s freedom struggle. Little, however, is known about the 80 people — around 50 of them in their 20s and eight in their teens — who accompanied Mohandas Karamchand Gandhi as he set off on March 12, 1930, for the 24-day, 338-km-long trek to defy the British-imposed salt tax. The Mahatma’s unknown foot soldiers dispersed soon after they arrived at the Dandi seashore on April 5. Now, an effort is being made to identify them and give a face to each of those unsung heroes. 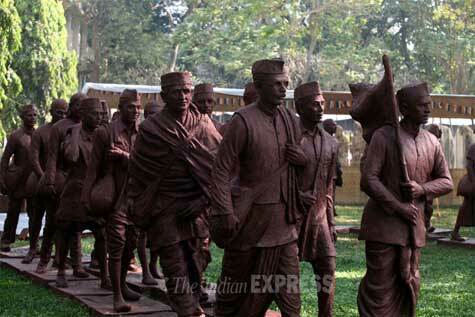 Forty sculptors — nine of them foreigners — are working on a ‘National Dandi March Memorial’, on the IIT Bombay campus, recreating an important chapter of Indian history with the help of blurred photographs, oral descriptions and old newspapers. Once the project is complete, in 2015, 80 life-size statues and a 15-feet-tall Gandhi statue will be installed on a 15-acre land opposite Saifee Villa where Gandhi halted for a night at the end of his Dandi March. This week, on February 12 — the ‘shradh day’ of Mahatma Gandhi — the sculptures will be on display on the IIT campus in Powai. 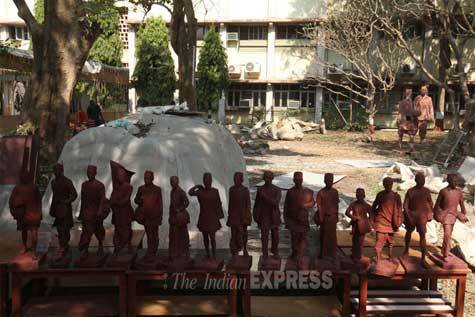 In a 360 sq m pandal on the 500-acre campus, artists are working day and night to meet the February 12 deadline. Ram Kumbhar, 28, has spent a fortnight sculpting the face of one Pyarelal Nayyar and another unknown person. It is difficult sculpting the facial features, copying them from blurred photographs, he says. All 40 artists were given 15 days to attend workshops organised by the IIT, refer to books written on the Dandi March, and read about the person whose sculpture they were making. “Making sculptures with just damaged and blurred photographs as reference is not easy; some of us even got marchers who haven’t been identified by name but whose picture is available. The workshops, however, were a great help,” Ram Kumbhar adds. 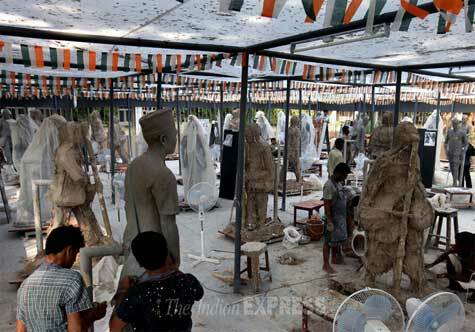 The 80 statues have been sent for bronze casting, which is the final and most important stage, says Kirti Trivedi, a professor at IIT’s Industrial Design Centre. The convenor of the project, he is the son of one of Gandhi’s closest associates, Kashinath Trivedi. As Trivedi points out, the satyagrahis, handpicked by Gandhi, dispersed as soon as the march from Sabarmati ashram in Ahmedabad to Dandi ended. That meant travelling across the country for two years to get details about the 80 marchers, interviewing their families and friends. Trivedi, along with a team of three design students and the staff of a consultancy firm, Design and People, conducted a number of field trips, to trace the individuals, collect details about them through old photographs and newspapers, even studying a 1930 film. Despite all these efforts though, the researchers are yet to source photographs of 35 marchers. “We have circulated pamphlets with details of the project and pictures of the marchers to various organisations promoting Gandhian values, and are expecting people to contact us to identify the remaining marchers. As of now, we have 80 names and some blurred pictures. We have to match the pictures with names. In many cases, we found the marcher’s old age pictures, but he was in his 20s when he participated in the Dandi March. However, these sculptures are not supposed to be exact replicas. For instance, while studying the picture of an old man, an artist can imagine what he looked like in his youth. In cases where we could not find pictures, the facial features, clothes, etc are based on the region they hailed from,” says Trivedi. Sethu Das of Design and People talks of a similar problem. “The highlight of the memorial will be giving a name to the unknown marcher. Identifying these people has been a challenging task. We have pictures based on which 80 life-size statues are being created. But who will identify them? In most cases, family members and friends of these marchers have died; their descendants have either moved to other cities or are untraceable. Many are unable to identify them as the marchers were very young and the pictures are mostly blurred,” he says. Finding some of the satygrahis was comparatively easy as their families are still connected with Gandhi and his beliefs. Take the case of Dhimant Dadhiya, the great grandson of Ramjibhai Dadhiya who participated in the march with his son Harakhji Dadhiya and son-in-law Ratnaji Borisa. Dhimant works at the Sabarmati Ashram in Ahmedabad. He says that Ramjibhai, a khadi weaver, hailed from Lathi village in Gujarat’s Amreli district, and had come to Mumbai in 1917 in search of a job. He was encouraged by Gandhi to go back to Ahmedabad and continue his khadi-weaving business. “The Dandi March memorial will give recognition to all the 80 satyagrahis. It’s a great project not only for my family but also for those youngsters who feel that their great grandfathers achieved nothing by participating in that march,” says Dhimant, who is president of ‘Gandhi Sena’. Thomas Titus is fighting with the Kerala government for recognition in the form of a memorial for the four satyagrahis who hailed from that state. “When my father died in 1980, I got it published in a newspaper. However, only a few Union leaders attended his funeral. Today, hardly anybody knows my father’s contribution to the freedom struggle,” says Thomas, son of Thevarthundiyil Titus, the only Christian to participate in the Dandi March. “My father refused to wear the Gandhi cap. Some of the marchers complained about this to Bapu, who told them that one does not become a satyagrahi by merely wearing a Gandhi cap; one has to follow satyagraha for that. My parents lived in the Sabarmati Ashram till 1936; they shifted to Bhopal in 1948. 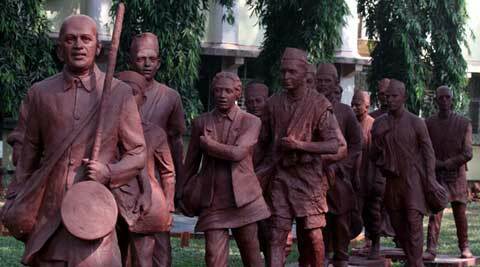 The memorial should have been constructed in the 1970s when many of these satyagrahis were alive,” says Thomas. The sculptors are working in two groups of 20 members each. Each of them has been asked to make two sculptures. The Indian artists hail from Maharashtra, Gujarat, Karnataka, Andhra Pradesh, Kerala, West Bengal, Assam, Delhi, Madhya Pradesh, Jharkhand and Haryana. Nine of them are foreigners, from the US, the UK, Japan, Bulgaria, Austria, Tibet, Sri Lanka and Myanmar. Gandhi’s statue is being crafted by renowned artist Sadashiv Sathe, 86, who is also the chief sculptor and workshop mentor. He has been working on the statue for more than eight months now and is likely to complete it soon. Sathe’s statutes have been installed across major landmarks — Gandhi statue at Delhi’s Town Hall, Shivaji statue near Mumbai’s Gateway of India, and Prince Philip’s statue at Buckingham Palace, London. Sathe says that he is not a Gandhian, but respects the Mahatma. “My approach to art is realistic. So far, I have made more than a dozen statues of Mahatma Gandhi, and this is going to be the biggest. Mentoring the workshop has been a very good experience. It is amazing to see these sculptors from across the world working on life-size sculptures within a limited time frame and with such excellence,” he says. Derek Maddox, 50, a sculptor from the US and part of the second workshop, finds the Salt Satyagraha an amazing piece of history. “The culmination of the movement and diverting it into positive energy are important for each one of us today,” he says. The Dandi March Memorial, a Culture Ministry project, was announced by Prime Minister Dr Manmohan Singh in 2005 on the 75th anniversary of the march. However the project’s design was approved only this year. A high-level committee was appointed, comprising 18 members, headed by former West Bengal governor and Gandhi’s grandson Gopalkrishna Gandhi. The committee approached IIT-B’s Industrial Design Centre in October 2010 and a design was chosen. At the committee’s first meeting on September 21, 2010, it was decided that the 80 satyagrahis would be represented by 80 rocks. Later, it was decided that life-size statues would be constructed, and that major events that took place during the 24 halts that Gandhi and his team made would be depicted through 24 3D murals. These will be placed along a half a kilometre stretch. Says Tushar Gandhi, the great grandson of Gandhi and a member of the committee, “IIT-B was initially approached to find out how to utilise solar energy in the project. Later, they submitted a design which was approved by the committee.” According to him, it is apt that the memorial is not dedicated to Gandhi alone but to those 80 satyagrahis who have been forgotten by history. “These 80 courageous men gave up their occupation to follow Bapu. They hailed from different parts of the country, belonged to different castes and creed, but came together to participate in the Dandi March. This memorial is a symbol of unity and the courage to keep walking against all odds,” he says. IIT-B’s Industrial Design Centre looked after conceptual design, coordination and implementation of the project. The Central Public Works Department has been overseeing the construction. The Union Culture Ministry is spending Rs 64 crore, of which Rs 22 crore is for research and development. The memorial will be 70 m high, with two stainless steel arms, which will be lit by solar panels. These hands will be raised upwards, holding artificial salt crystals. According to CPWD officials, the design concept includes gradual illumination of the structure as the sun goes down. A small lake will be dug up at the memorial complex as a symbolic representation of the seaside.